LOS ANGELES — This time, the Dodgers needed just five pitches to get their first hit off of Matt Moore. It didn’t stop there. Moore had the worst start of his career, recording just three outs and giving up six runs. The Giants lost 9-3, putting an unofficial end to their chase for a National League West title. The Dodgers’ magic number is down to five, meaning they can clinch a fourth consecutive division title as soon as this weekend. Moore lost a no-hitter with two outs in the ninth the last time he took the mound at Dodger Stadium, but he wasn’t fooling anyone Wednesday night. Three of the first four batters reached, putting Moore in a tough spot against a resurgent Yasiel Puig. The right fielder, who spent much of the second half in Triple-A, blasted a low fastball over the wall in right-center, giving the Dodgers a 4-1 lead. Matt Cain and Josh Osich started warming up as Moore continued to struggle, and only a baserunning mistake kept the lefty from being pulled in the first. Opposing pitcher Kenta Maeda drove in a run with a single but Enrique Hernandez was thrown out trying to take third. Moore, who threw 36 pitches in the opening inning, got a brief break, but his night wouldn’t last much longer. 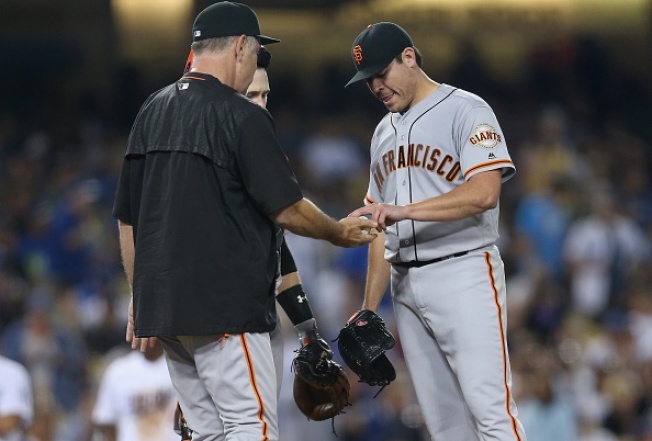 Manager Bruce Bochy came out with the hook after Moore opened the second by hitting a batter and giving up a single. Matt Cain was the first of many to come out of the bullpen, but the results never got any better. The Dodgers scored in four of the first five innings. The Giants had a split-squad lineup on the field by the sixth. Starting pitching report: Moore had one previous one-inning start in the big leagues, but he was only pulled by the Rays that night because of a two-hour rain delay in the second inning. There was nothing positive about his start Wednesday, but if there’s a silver lining, Moore’s 45 pitches should easily allow him to return Sunday on three days rest if the Giants want to use him in the Johnny Cueto slot. Bullpen report: The relievers used, in order: Cain, Josh Osich, Jake Peavy and Ty Blach, who pitched three perfect innings on just 26 pitches. At the plate: Ehire Adrianza has two homers this year and both have come against the Dodgers. He took Clayton Kershaw deep in April and pulled a Maeda offering into the seats in the second inning. In the field: Puig made a tremendous over-the-shoulder, on-the-run catch to rob Panik of extra bases and end the fourth. It’s hard to believe they’ll actually trade the guy. Attendance: The Dodgers announced a crowd of 45,983 human beings. Hopefully they appreciated Carlos Ruiz and Hernandez going with “In the Air Tonight” and “Pony” as back-to-back walk-up songs. Up next: Four with the Padres. The Giants swept all three meetings in the first half, but they’re 0-6 against San Diego since the All-Star break.